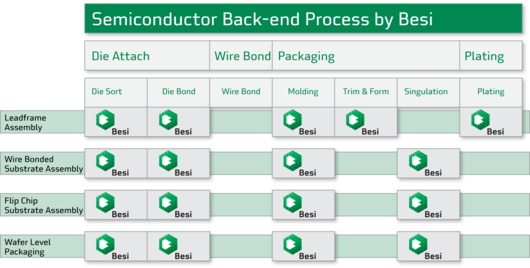 Besi is a leading supplier of semiconductor assembly equipment for the global semiconductor and electronics industries offering high levels of accuracy, productivity and reliability at a low cost of ownership. 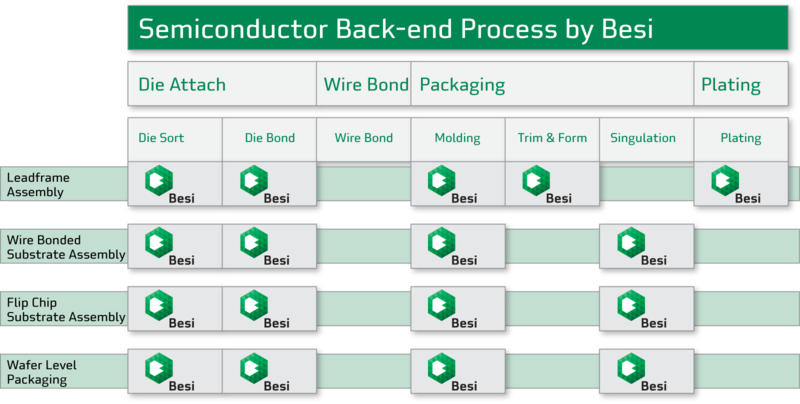 Besi develops leading edge assembly processes and equipment for leadframe, substrate and wafer level packaging applications in a wide range of end-user markets including electronics, mobile internet, computing, automotive, industrial, LED and solar energy. Customers are primarily leading semiconductor manufacturers, assembly subcontractors and electronics and industrial companies. Besi's ordinary shares are listed on Euronext Amsterdam (symbol: BESI), its Level 1 ADRs are listed on the OTC markets (symbol: BESIY Nasdaq International Designation) and its headquarters are located in Duiven, the Netherlands.